A statue stands in a park in Quebec City, Canada as a memorial to Francois Xavier Garneau who wrote a three volume history of the French Canadian nation between the years of 1845 and 1848. He was born in Quebec City in 1809, was recognized in his life as a French Canadian poet, civil servant and liberal and died at the age of fifty-seven. 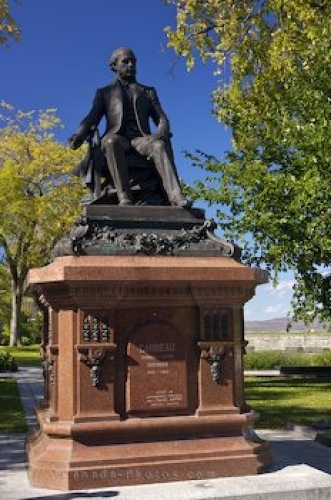 Statue of Francois Xavier Garneau, a historian 1809-1866, in a park beside Porte Saint-Louis, Quebec City, Quebec, Canada. Picture of a statue of Francois Xavier Garneau in a park in Quebec City, Canada.